October 24, 2014 By This post may contain affiliate links. 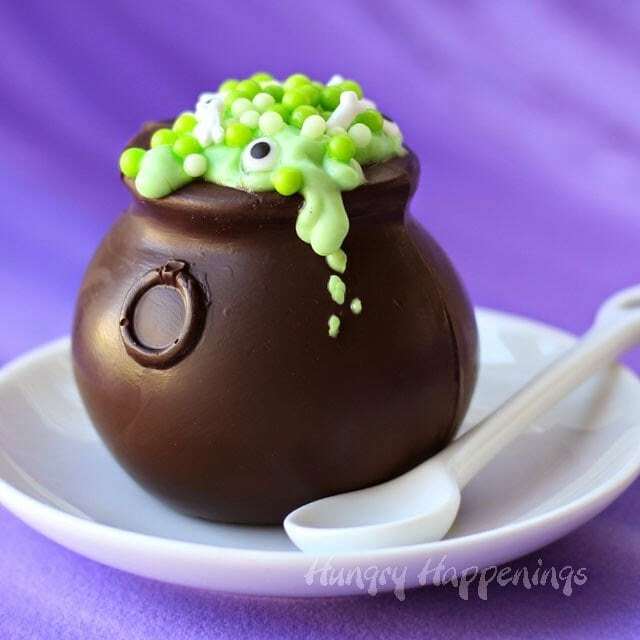 I stirred up a witch’s brew this Halloween for Collective Bias using Snack Pack Pudding inside Chocolate Cauldrons. My secret potion is filled with fun mix-ins and tastes as magical as it looks. 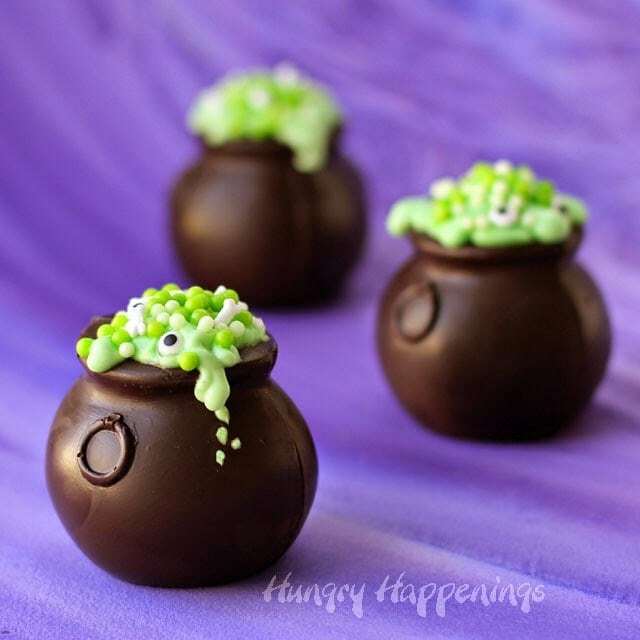 I whipped up these Chocolate Cauldrons filled with Snack Pack Pudding and Magical Mix-Ins for a group of kids who took time away from playing and relaxing during their fall break to come over and help me decorate for our Halloween party. The kids are really excited about the party and were eager to help, and I was thrilled to have them. so I made them a special treat to thank them. I am crazy busy right now, so fortunately, it only took me about 45 minutes from start to finish to conjure up four of these festive looking holiday desserts. I would have wiggled my nose or waved my wand and had them made in a snap if I had magical powers, but being that is just not in the cards for me, I had to do the next best thing and find something to make that would taste amazing but wouldn’t take me all day. I quickly whipped up four chocolate cauldrons then grabbed a few packages of Chocolate and Vanilla Snack Pack Pudding to fill them. Then, I mixed in some Oreo Cookies to give the Chocolate Snack Pack Pudding some crunch, and colored the Vanilla Snack Pack Pudding green and topped it with some potion ingredients. Once I snapped some pictures, I brought my cauldrons next door and presented them to the kids. They were so excited that I felt like I did indeed have magical powers. 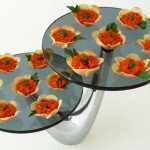 *The amount of chocolate you will need will vary depending on how thick you paint it into the mold. For instructions on melting chocolate or confectionery coating, please see my Chocolate Making Tips page. Spoons some chocolate into each cauldron cavity in the candy mold. 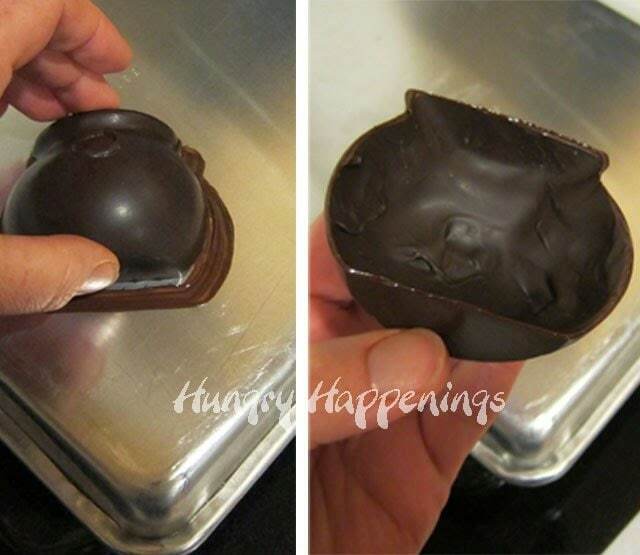 Spread the chocolate into a thin layer all around the mold, making sure it’s thick enough that you can’t see through it. 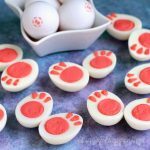 Pop the molds in the refrigerator for 10-15 minutes if using semi-sweet chocolate or into the freezer for 10-15 minutes if using confectionery coating or candy melts. 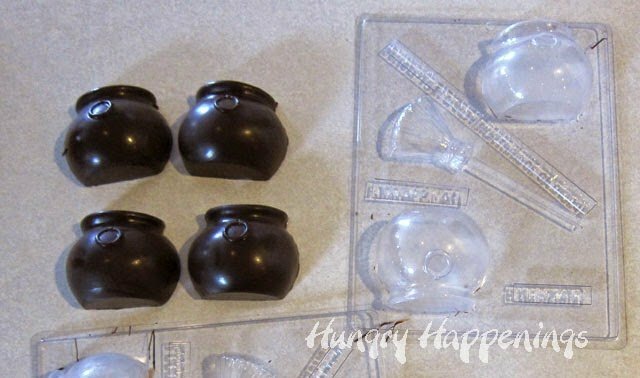 Remove molds from freezer and pop the chocolate cauldrons out of the molds. Set a baking sheet over a burner on your stove and turn on the heat for about 20-60 seconds. I use a gas flame, and it takes about 20 seconds. Electric will take longer. Set one half of a chocolate cauldron on the hot pan, allowing the edge to melt just a little. Press that half onto another half and hold the cauldron for a minute until the chocolate begins to stick. Allow the cauldrons to sit for a few minutes to harden. Hold a round metal cookie cutter using metal tongs over the flame of a gas stove or candle for 5-10 seconds to get it hot. 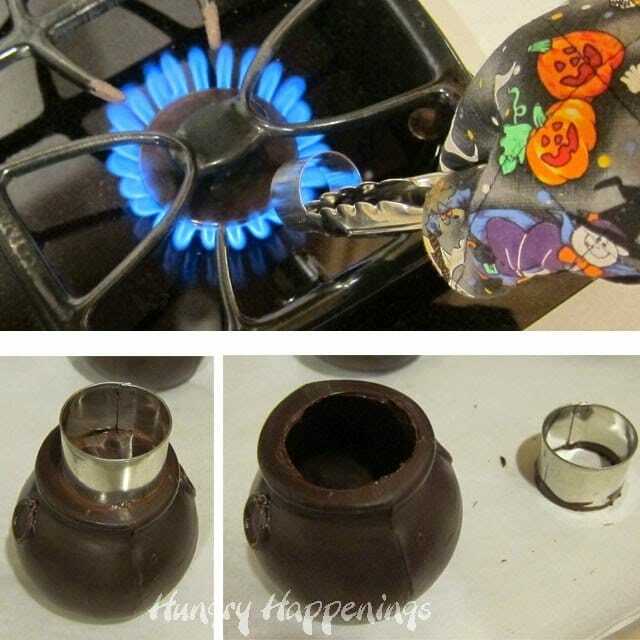 Immediately set it on top of one of the chocolate cauldrons, allowing it to melt a hole in the chocolate. 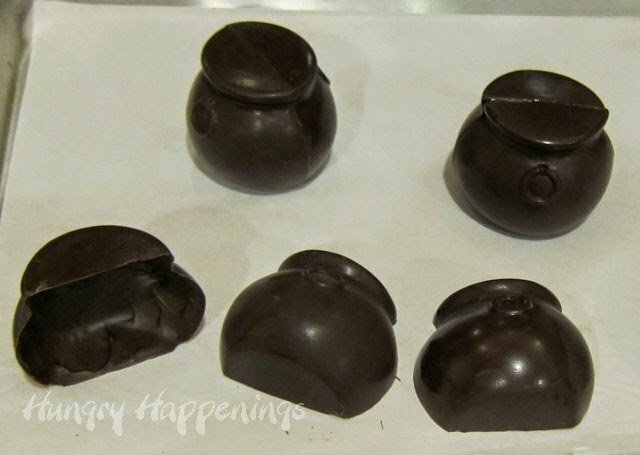 You may need to press down a bit to get it to cut through all the way, just be gentle, you don’t want to crack your cauldrons.Remove the cutter, wash it, and repeat creating openings in all four chocolate cauldrons. Now for the fun part, making your witch’s brew. 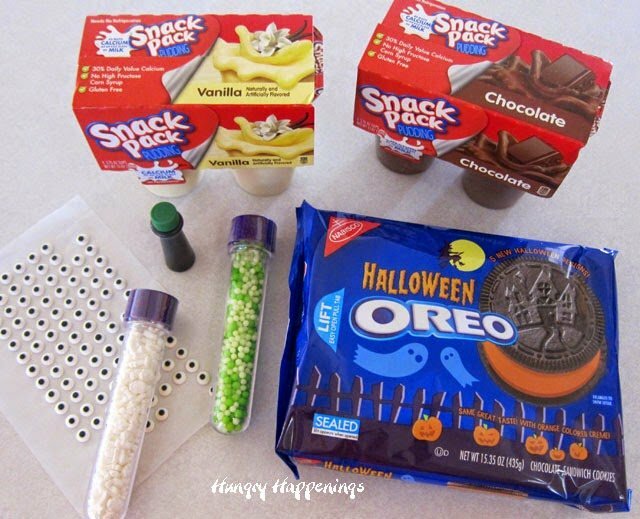 You’ll need to get your Snack Pack Pudding, Oreo Cookies, green food coloring and sprinkles ready. 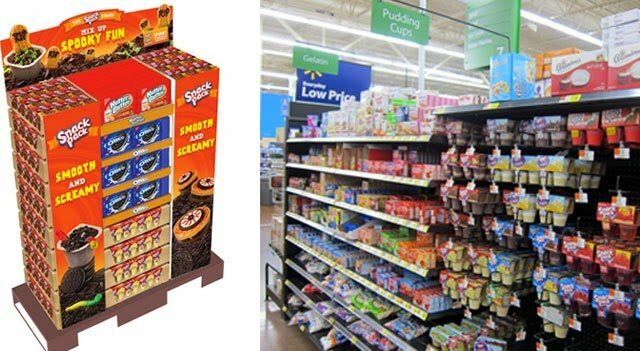 I got my Snack Pack Pudding at Walmart, and right now they have a fun Halloween display filled with pudding cups and Oreos and Nutter Butters which are great mix-ins. 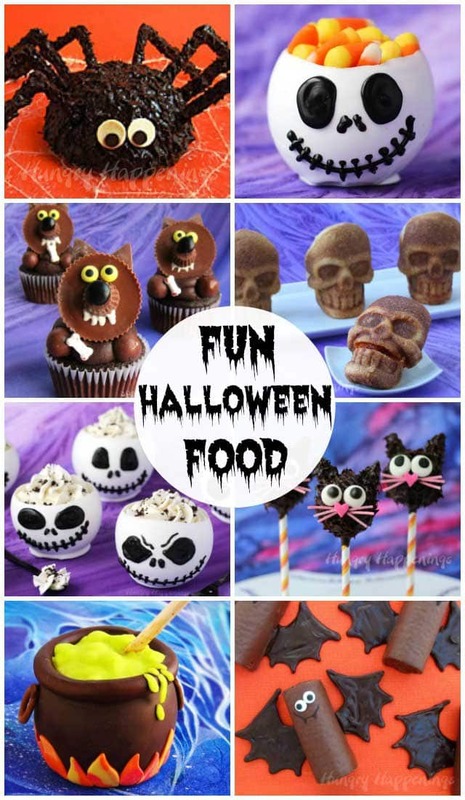 I love how the display shows how to turn the pudding into fun Halloween treats. Seeing big pictures of edible crafts on store displays makes me a bit giddy. So many people are starting to make festive food for holidays and special occasions, and I feel like a major part of that trend, and it’s exciting. 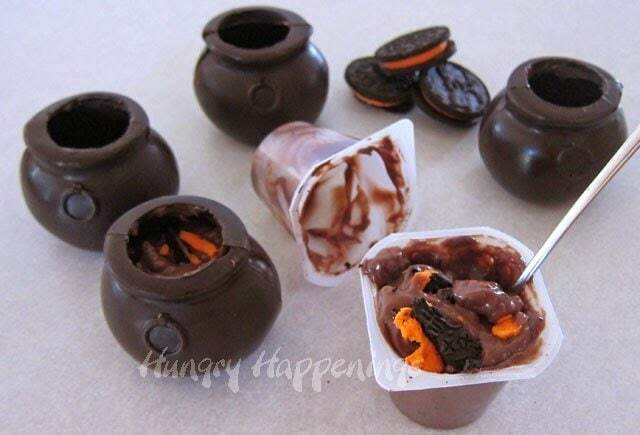 You’ll need one full chocolate pudding cup per cauldron. To add a little crunch to the chocolate pudding, break up one and a half Oreo Cookies and stir the pieces in, then spoon it into the cauldron. Stir a few drops of green food coloring into the vanilla pudding and spoon some on top of the chocolate pudding. 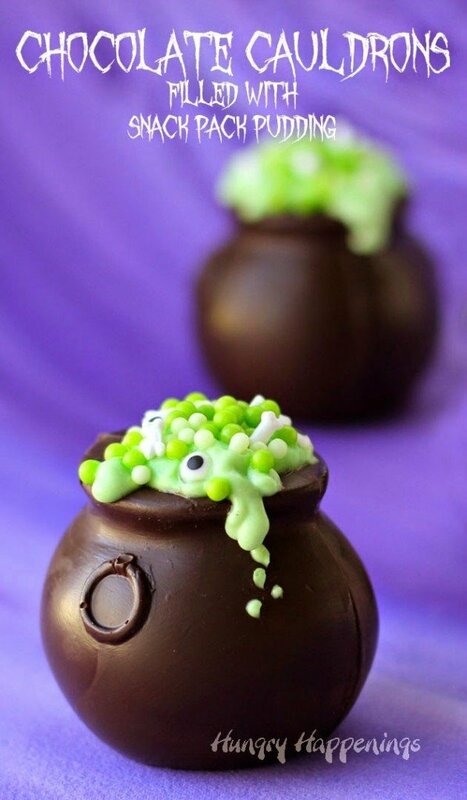 I spooned some into a small zip top bag and squeezed it into dribbles on my cauldrons then sprinkled on some green non-pareils and added a few candy eyes and bone shaped sprinkles. These desserts are decadent, that is for sure, but I did feel good that the cauldrons where made of a good quality dark chocolate and were filled with calcium rich pudding. 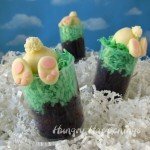 While making these, I was happy to learn that each Snack Pack Pudding cup contains the same calcium as an 8 ounce glass of milk. The best thing was knowing the kids loved their special treats. All opinions are mine alone. I sure wish I did, don't you? I always wanted to be able to twitch my nose and make some magic. The kids came back over today to help out some more! Gotta love the power of chocolate and pudding. How CUTE!! I never in a million years would have thought you put pudding in the middle. You are brilliant! Thanks. The kids were surprised there was pudding inside too. They loved it. I'm so glad you found my tips helpful. 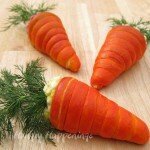 My Chocolate Making Tips page has really extensive tips for working with chocolate, that I don't often re-write the information in each post, but do try to share my experience. I'm happy it helps. Whoa they look amazing! So fun and perfect for Halloween. And so easy! Thanks for the idea, it looks like a lot of fun for the kid. Thanks, they really turned out great and the kids thought they were so cool. This is just way too cute!! Thanks, Hilary. I love the name of your blog! OMG, what a clever idea! I love your photos. Thanks, I was so happy with the cauldrons and the pictures too. Thanks, Jessca. I love pudding too and the cookies mixed in make it even better. 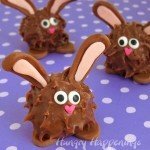 These are absolutely adorable. I bet they were a big hit with the kiddos. Btw. . . I can’t believe that you whipped them up in only 45 minutes. 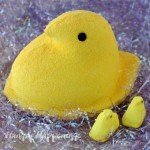 They truly look like you spent hours making them. Thanks, Lynn. 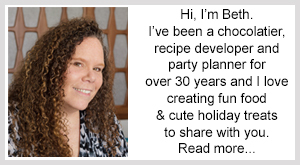 I’ve been making chocolates for over 30 years and am very quick. I was really happy with how the cauldron’s looked!